Scientists at Radboud University discovered a new mechanism for magnetic storage of information in the smallest unit of matter: a single atom. While the proof of principle was demonstrated at very low temperatures, this mechanism shows promise for room temperature operation. In this way, it will be possible to store a thousands of times more information than in current hard drives. Their findings are published today in Nature Communications. As our current computing architecture is not getting much faster and using a lot of power, combined with the exploding demands to store information, researchers are interested in new strategies to store more information in an energy efficient way. One potential pathway is to store information at the ultimate scaling limit: a single atom. "Computers have reached fundamental limitations as to how much better they can get, creating a huge demand in materials research for alternatives. Modern computers use a lot of electricity, currently demanding more than 5 percent of the world's electricity. Fundamental science says we can gain a lot more in energy efficiency. We are focusing on a very basic component of modern computers: a bit of memory. We use atoms, because they are the smallest unit of matter and also enable us to further understand the fundamental science behind their behavior. Our current question: how can we store information within a single atom and how stable can we make that piece of information? ", first author Brian Kiraly explains. When you get down to the single atom level, atoms which are magnetic, no longer remain stable. "What defines a permanent magnet is that it has a north and a south pole, which remains in the same orientation," professor of Scanning Probe Microscopy Alexander Khajetoorians explains, "But when you get down to a single atom, the north and south pole of the atom start to flip and do not know what direction they should point, as they become extremely sensitive to their surroundings. If you want a magnetic atom to hold information, it cannot flip. For the last ten years researchers have been asking: in order for the atom to stop flipping, how many atoms are needed to stabilize the magnet, and how long can it hold it information before it flips again? In the last two years, scientists in Lausanne and at IBM Almaden have figured out how to keep the atom from flipping, showing that a single atom can be a memory. To do this, researchers had to use very low temperatures, 40 Kelvin or -233 degrees Celsius. This technology is limited to extremely low temperature." Scientists at Radboud University took a different approach. By choosing a special substrate – semiconducting black phosphorus -, they discovered a new way to store information within single cobalt atoms, that bypasses the conventional problems with instability. Using a scanning tunneling microscope, where a sharp metal tip moves across their surface just a few atoms away, they could "see" single cobalt atoms on the surface of black phosphorus. 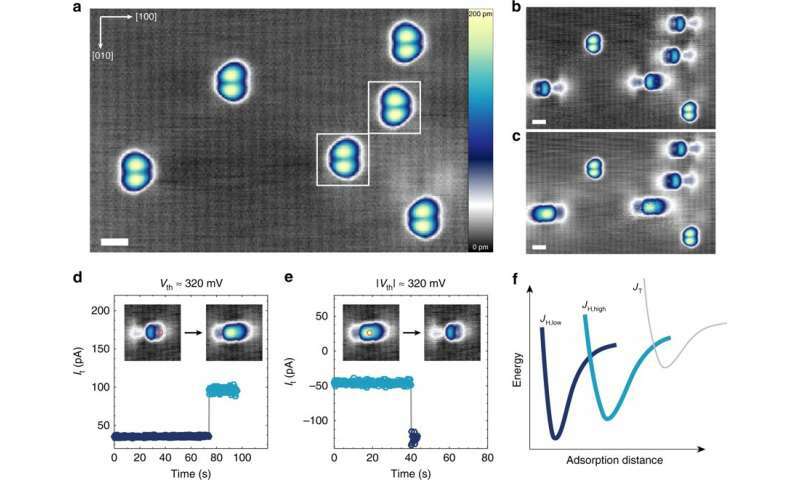 Because of the extremely high resolution and the special properties of the material, they directly showed that the single cobalt atoms could be manipulated into one of two bit states. The electrons in an atom orbit around the nucleus, but also "spins" themselves, much like the Earth rotates both around the Sun and its own axis. The total amount it spins, or its angular momentum, is what gives us magnetism. "Instead of this spin angular momentum, which previous researchers have used, we figured out a way to make an energy difference between a few of the orbitals of the cobalt atom and now use the orbital angular momentum for our atomic memory. This has a much bigger energy barrier and might be viable to make the single atom memory stable at room temperature. In the end, it is still a magnet with an angular momentum, but we are now able to control the atom from 0 to 1 state, which has a much higher stability than other magnets," says Kiraly. "When we first conducted the experiment and saw this binary switching, we weren't sure what was going on. In a beautiful collaboration with theorists from Radboud University, Misha Katsnelson and Sasha Rudenko, we were able to point out that we were observing the atom's orbital moment and had created a new memory," Khajetoorians adds. Right now, the elements that store hard drive bits are still a thousand times bigger than an atom. Khajetoorians: "What this work means is that, if we could construct a real hard drive from all these atoms – and we are still a long way from that – you could store thousands of times more information."